The Forever Now: Contemporary Painting in an Atemporal World is the kind of show you'd expect MoMA to do more frequently—a compact survey of young painters expanding the genre, curated by Laura Hoptman, like a biennial (and including a number of artists that were in the last Whitney Biennial). In press materials, the obtusely titled show is parsed into four loose categories: reanimation, reenactment, sampling, and the archetype, which provides intellectual crunchiness if you prefer to go deeper than "I know what I like." Kerstin Brätsch—some of Brätsch's "Blocked Radiant" paintings sit outside the gallery, like either greeters or warnings; frittery shapes surround fuzzy orbs. The large installation inside, Sigi's Erbe (Agate Psychics) (2012) is composed of a metal framework off of which hang panels made of glass or aluminum with imaergy, or of agate segments arranged into compositions, all meant to be seen from both sides. Mark Grotjahn—his carefully arranged psychedelic compositions of layered arcs, such as Untitled (Circus No. 6 Face 44.22) (2013) could be biological snapshots, or dense jungle. They are hermetic new worlds. Julie Mehretu—she has relaxed somewhat from her hypothetical utopias that approach architectural renderings into scribbled graphite-hued fog banks that will be unavoidably compared to Cy Twombly, such as Heavier than Air (written form) (2014). Dianna Molzan—what she does—playing with the traditional format of painting—may not be entirely revolutionary, but it is entertaining and beautifully done. In the example pictured here, she has painted on sheer silk, which is then stretched onto bars so that both the canvas and stretchers are visible. In others, she slices the canvas, or reduces it to a net, whose strings receive the paint. 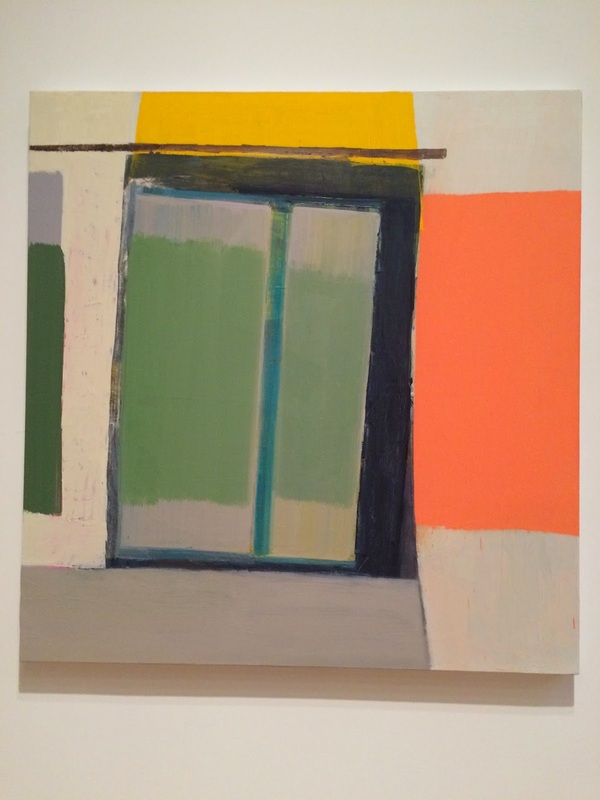 Amy Sillman—among the more traditional-seeming painters, which is perhaps the most ambitious. Her still lives and portraits resonate for their reductive shapes and gorgeous palettes. Oscar Murillo—his extensive representation within the show is enough to make a statement. He pieces together canvases, using primarily dark hues with looping scrawls and dense occlusions. 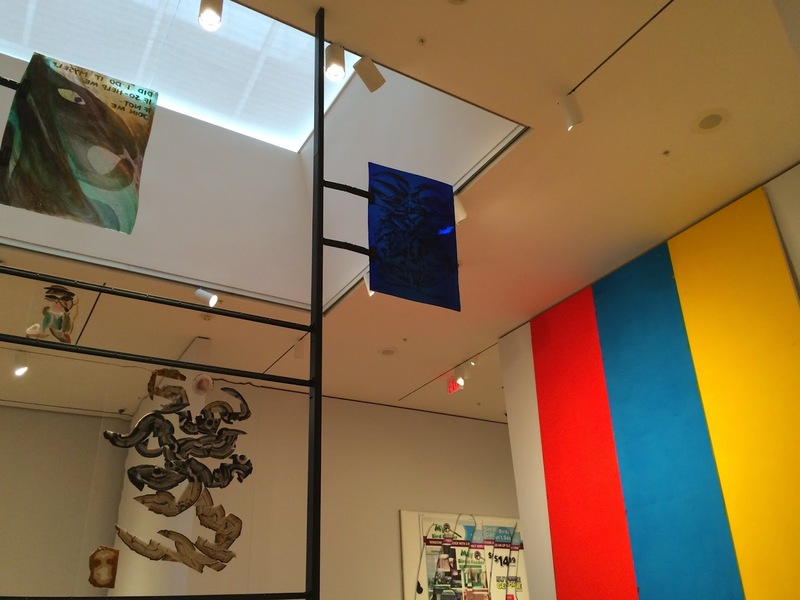 The exhibition, through April 5, is on the sixth floor, next to the Matisse Cut-Outs. 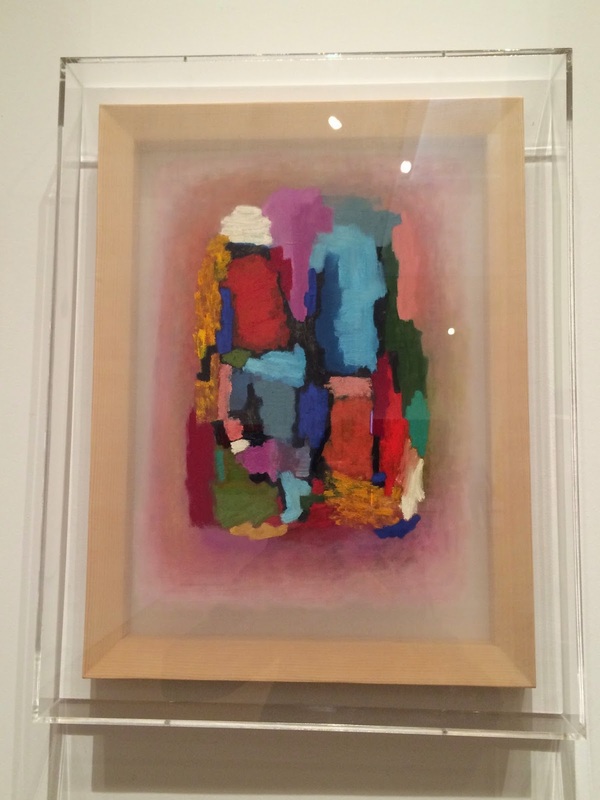 Catching both might give you a sense of the ongoing continuity within art.